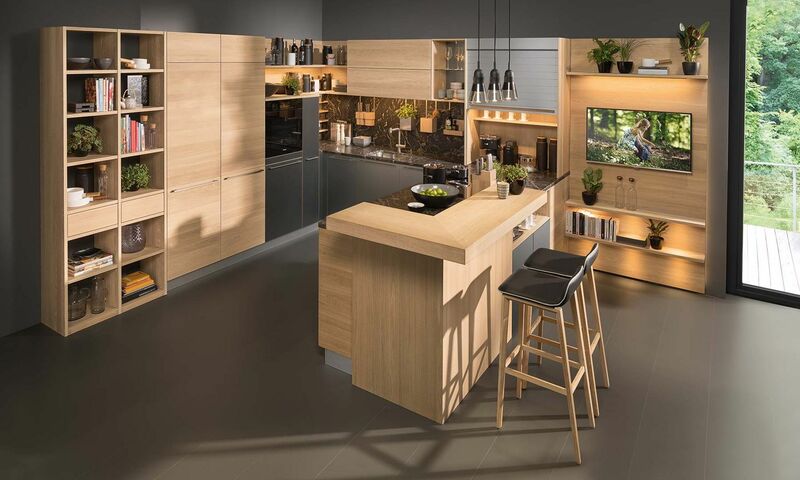 With its wide range of models, the linee kitchen offers the perfect solution for every space situation. 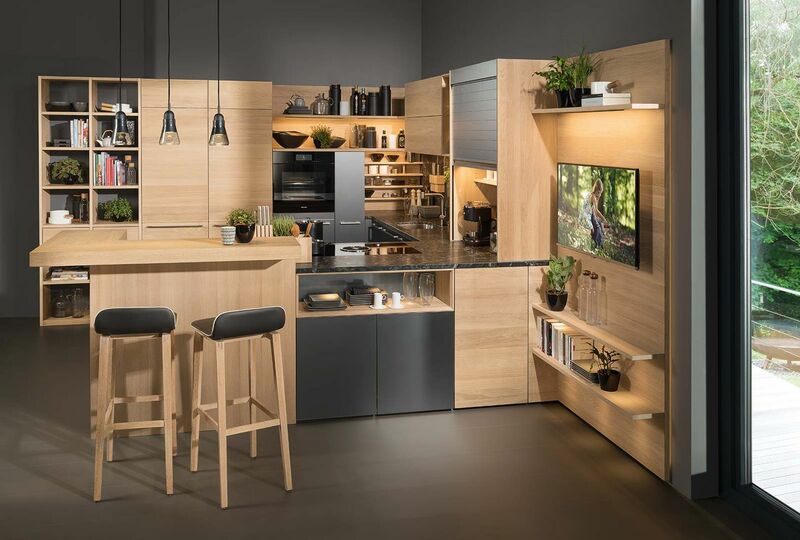 The large number of configuration options enables individual kitchens to be designed to meet any taste: from the simple kitchenette to the luxurious eat-in kitchen island, classic or modern – perfectly adapted to your requirements. The linee kitchen is not only incredibly versatile, it also comes in many different guises. This is because different handles, as well as a wide range of fronts and elegant coloured glass sides, offer plenty of design options. Alcove units with rear walls of wood or coloured glass loosen up the appearance of the kitchen and make it feel cosier. The open, flush-mounted solid wood bodies of our design elements can be perfectly integrated into the kitchen and offer space to present decorative accessories – similar to a display case. They can also be designed with dimmable LED lighting and glass doors in clear glass or smoky glass. The rear panels are available in solid wood with a horizontal or vertical grain texture, as well as in coloured glass. This way you can easily and flexibly give your kitchen a personal touch and a pleasant and comfortable atmosphere. Anyone would want to cook in this kitchen. With its nearly endless planning options and many innovative functions, the linee kitchen makes every day easier for you. A light pressing motion is all it takes to open drawers and doors. And practical power sockets are hidden behind beautiful solid wood. This turns cooking into a genuine pleasure. The perfect material, perfectly finished. As with all TEAM 7 kitchens, the bodies of our linee kitchen are produced with Austrian quality craftsmanship from real solid wood. This makes them extremely robust and very durable. Another major benefit is that the wooden surfaces finished with natural oil are especially suitable for everyday use and are easy to maintain. From simple, daily cleaning to minor repairs of dents and scratches.